Ever felt that little itch when you’ve travelled somewhere special? That feeling of excitement that never leaves you? Last June, Caskstrength had that exact feeling when I made my first ever trip to Japan. It is undoubtedly the most mindblowing place we’ve ever seen, from the bright lights and (organised) chaos of Tokyo to the serene and highly spiritual Kyoto. You can drink in as much as you can in one huge gulp, but you’ll need to take a second, more refined sip, just to appreciate all the rich cultural flavours. Luckily for us, we recently had another opportunity to travel back and dig a little deeper. 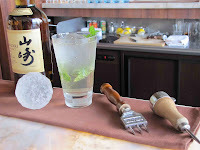 Our second Japanese odyssey was a brief 6 days but a trip, which would cover 2 very important places- visits to both the Yamazaki and Hakushu distilleries. The outbreak of Swine Flu had prevented us from visiting these previously, so this time we were rearing to get in and have a nose around. 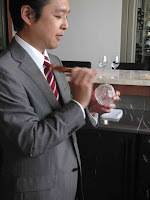 Fighting back jet lag, our first appointment was to meet the unflappably ‘cool’ Takayuki Suzuki, Bar Director at Bar à Vins, based on the 25th floor of the imposing Shiodome Park Hotel in Tokyo. 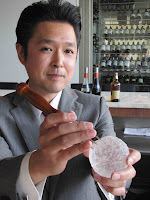 Mr Suzuki or ‘Mr Ice’ as he is affectionately known in the bartrade has achieved an almost legendary status in Japan for popularising the ice ball, a perfectly spherical piece of ice, hand carved at lightning speed from a large irregular block, using only an razor sharp knife and ice pick. The Iceman takes but seconds to carve these incredible works of art, yet they chill your drink for nearly an hour without melting! It’s highly impressive stuff, as you’ll see below. We tried to video the man in action, but all we got was a blur of hands and a lense full of ice shavings. 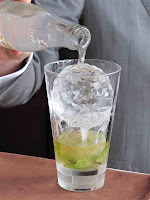 “Jetlag begone!” screams my empty glass, with a firm Japanese tongue. 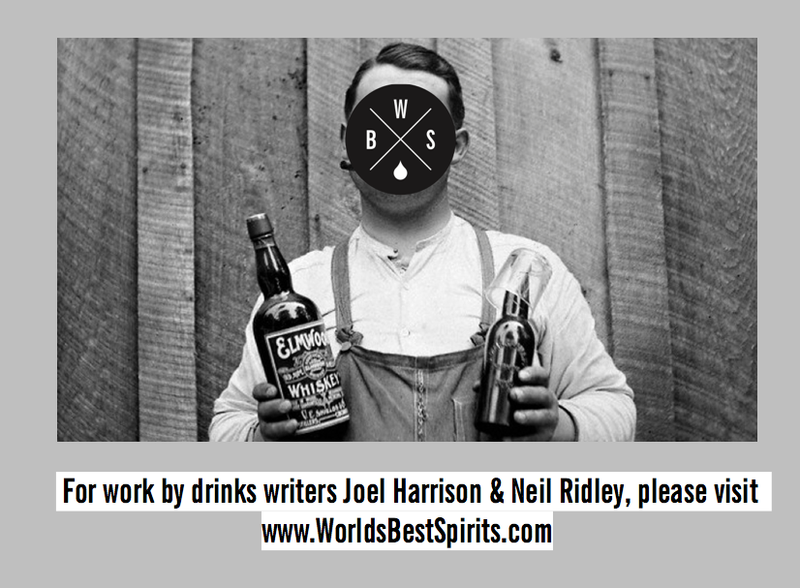 And it works, one Yamazaki Breeze and we’re feeling refreshed. 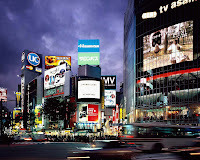 A little while later we ‘re travelling to our next destination – the Shinkansen Bullet Train to Kyoto in the Kansai Plain, home of the Yamazaki distillery. 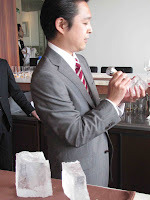 One of our travelling companions is the irrepressible Dr Koichi Inatomi, the man who, back in the early 1980’s set about a technical revolution at Yamazaki, redesigning the distillation process and in turn, producing the first whiskies which would go on to set the benchmark for Japanese whisky around the world. Dr Tomi (as he prefers) modestly explains that one of his greatest personal achievements was helping to create the Yamazaki 18yo expression, one of Caskstrength’s current favourite tipples. As we pull up to the gates of Yamazaki Dr Tomi suddenly chimes out – “See... Japan is just like Scotland!” pointing to the clouds above our heads. Yes, it’s raining profusely. The main courtyard at Yamazaki is impressive, where employees dressed in well-fitted khaki jackets and caps are ferried around on small golf carts, giving the place a similar feel to the secret headquarters of a Bond villain. Being sartorially conscious, we enquire as to whether the employee outfits are for sale- alas not, but the jackets are the sort of thing you could see Brad Pitt rocking up to a film premiere in. 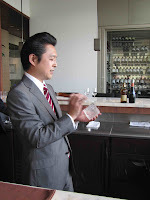 To business and we are fondly greeted by our host, Mike Miyamoto, general manager of the distillery. 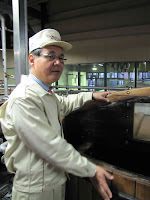 Miyamoto-San begins our tour with a brief history of Yamazaki and then takes us through to the mash room. 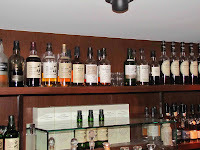 Surprisingly, all the malt is imported in from Scotland, as the prices of domestic barley are extortionate and much in demand for the brewing industry, which eclipses the whisky business. 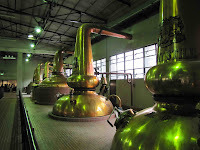 The distillery manufactures around 3 million litres of spirit per year with about 1 tonne producing just 400L, so you can imagine the scale of importation involved. The stillroom is where we really start to feel a sense of excitement- with virtually no trade between rival Japanese companies, distilleries need to be able to manufacture a broad range of spirit style, from the light, estery and fruity styles which go into Yamazaki 12yo, to much heavier more textured spirit, which helps make up some of the interesting blends under the Suntory empire, such as Hibiki. The stills are all completely different sizes and shapes with viewing portholes all the way up the necks. We’ve seen this on many other stills, but not to the same extent. Mike explains that our next port of call is important, as it will demonstrate the importance of the use of Japanese oak in the whisky made at Yamazaki. 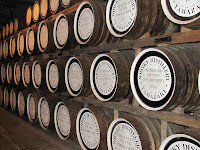 We wend our way down to the vast on-site warehousing, full of immaculately arranged casks. 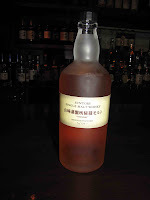 Quercus Mongolica or Mizunara oak is very expensive to produce, only growing in the northern part of Japan and as a result, casks are in short supply. 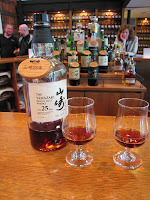 But one thing you can immediately notice is the undoubted spicy, fragrant notes that Mizunara oak gives to a whisky. 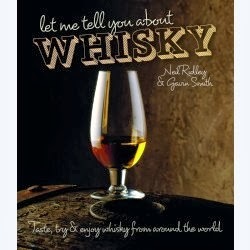 We try a direct cask sample and it is cedary, perfumed and utterly irresistible. 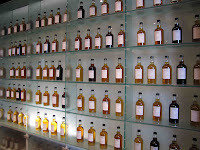 Most of the casks here are stencilled with ‘Pure Malt’. Mike explains that back in 1984 the phrase single malt meant very little in Japan and as a result, Pure Malt was adopted. “Our coopers are only just getting round to updating the stencils- things are slow to change here!” laughs Mike. But there is a poignancy to his last sentence. A proud level of tradition is observed from the top of the company, right down to the cleaners, who still use old fashioned brooms to keep the distillery spick and span. 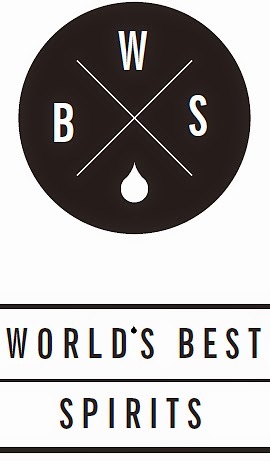 Mike neatly sums up that to make world class Japanese whisky, they must keep applying continuous refinement to the process. Long may that continue. We are now treated to some excellent Yamazaki drams, including the 12yo, 18yo, the newly released 1984 bottling (an exquisite mix of wax, fragrant honey, dry sherry and dried fruits) the very hard to find 25yo (woody, dark and very dry indeed) plus a little dram of Hibiki 17yo, but our eyes turn to the wall of exclusive bottlings. With pens at the ready, we dive in. Nose: Super soft peated notes, with lots of summer fruits, sherbet lemons, fragrant pipe tobacco and some brown envelopes. Brilliantly balanced. Palate: An immediate hit of fresh green apple, cream liqueur and then masses of summer fruit compote. How they make this whisky so fruity is beyond me. Finish: Light, but lingering, the mouth is left with a superb silky feel. 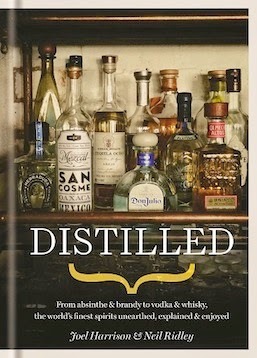 Overall: I bought a bottle of this whisky to return home with, as sadly there are no plans to import it yet. 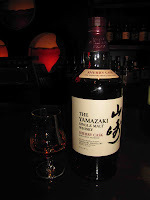 I sincerely hope they change their minds- it opens up another dimension to the world of Yamazaki. Another cracker. Nose: Gravy browning!! Very meaty, with a huge sherrywood influence, giving a musty, slightly foisty note. Then comes that hint of rich fruit, spice and burnt oranges. Similar to the 18yo, but clearly much more intense. Palate: Exceedingly dry on the palate, but opens up with water, giving mincemeat notes, Oloroso sherry sweet/dryness and minty notes. Finish: The dryness lingers with a little spiciness prickling the palate for a few minutes. Overall: In general terms of whisky making, this would be classed as an excellent dram, but we can’t help feeling that the wonderful 18yo manages to get the rich sherry/fruit balance perfect and this would come a definite second. 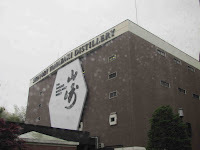 Next post- We visit the Hakushu distillery, have a crack at blending some whisky and nearly boil our hand in an interesting dining experience called Shaba-Shaba! !